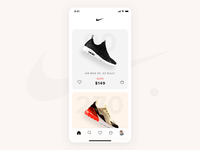 There is another shot from concept of a Nike store iOS app. This time I present you a checkout process, also enriched with some clever animations. Show us love! Press "L".Want to see more projects? Visit our profile and remember to follow us!